Have you ever found yourself knee-deep in someone else’s drama? Ever allowed their problems to affect you so much that you end up carrying their issues in YOUR tissues? Yeah, me too. A friend tells you about an emotionally-charged problem she’s having, and you get upset about it. Family members get into an argument about something minor, and it affects your mood. It’s just how it goes, right? Not necessarily. Friend or loved one expresses great anxiety about a situation he or she is experiencing. As soon as you sense negative energy in the story, recognize that you have a decision to make. You can get involved in the emotions of the story teller, or you can create a protective emotional buffer around yourself. Should you decide to create that buffer (I highly recommend it! ), simply watch the situation unfold as though you were viewing a movie with a big tub of popcorn in your lap. Sit back. Watch. Listen. Allow the story to unfold, saying little or nothing for as long as you can. Compassionately connect with the author of the story while you let that buffer protect your energy. As a responsible movie-going audience member, do not take the problem on as your own. Instead, be a popcorn-eating observer. 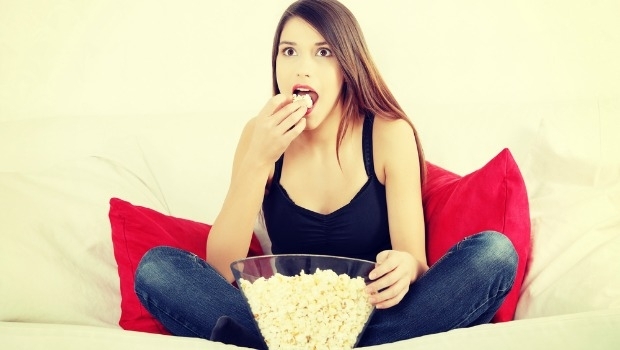 Eat Your Popcorn when loved ones are upset with significant others, when parents worry incessantly about their kids, when friends feud, when people in your presence are verbally sparring. Most of all, Eat Your Popcorn when your ego tells stories about emotionally-charged events in your life. The light, airy, fluffy buffer you create for yourself allows you to see most every situation with more clarity and less unnecessary emotion. Bon appetit! Want a little extra help managing life’s dramatic twists and turns? Join us at You Power Yoga, where we practice that skill every day. First class is FREE! Denise Springer is owner/instructor at You Power Yoga in Edmond, OK.